Before you opened your private practice, you thought a lot about the work you wanted to do. You identified the sessions in which your clients had tremendous breakthroughs and daydreamed about the impact you could make on your community. You also fantacized about calling your own shots, structuring your own days, and choosing the people you wanted to serve. But once you opened your doors, you quickly realized the amount of work it takes to get a practice off the ground and to fill it with engaging, exciting clients. So, you started to hustle. You met with all the doctors' offices, you reached out to all the local therapists, and you went to all the networking events. You realized, "Hey, this is actually doable. I can build a profitable practice." But, soon you found yourself exhausted and on the brink of burnout. Even though things were working, and some clients were coming, you had to admit this marketing approach wasn't a match for the type of therapist you wanted to be. In fact, it was unsustainable. You knew there had to be an easier way to increase your reach and your practice’s visibility without having to be physically present. You’d sort of heard about content marketing and the fact that having an online presence can bring you more ideal clients. So, you threw together a quick blog post about mood disorders (or was it anxiety…), posted it to your website, and waited for the calls to pour in. But nothing happened. The blog wasn’t shared, the post wasn’t read, and the phone didn't ring. - You feel lost. And frustrated. And depleted. You know you need to attract more ideal clients to not only sustain your practice, but to feel fulfilled and continue to be of service to those in need. But, you also know that a perpetual high level of hustle is only going to drive you into the ground. - You're positive that if you continue to spend all of your time away from the couch networking and marketing your practice, you’re never going to have time for what it is you actually love – therapy. - You’re ready to step back from in-person marketing, understand the emotional scheduling process of your clients, and utilize the internet to fill your caseload. You wont be inundated with a ton of overwhelming information and left out in the wind to sort through it alone. You won’t be on a weekly call with dozens of other students vying for individual attention or trying to get your questions answered. 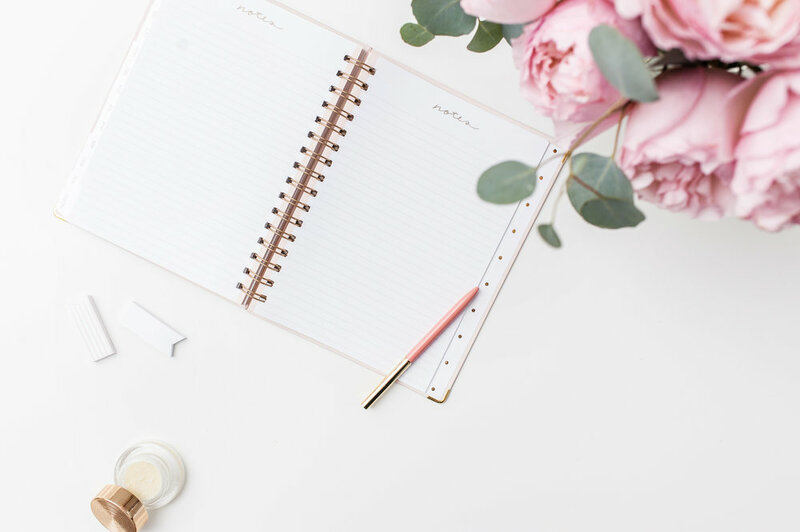 You will believe in your ability to speak to your ideal client in a way that elicits an emotional response and in a way that makes them want to schedule a session with you. You will continue to grow your practice while saving time and preserving energy for yourself and your paying clients. Every Monday you'll receive a brand-new module with lessons about online marketing. Each Wednesday there will be open office hours and you can hop in at your convenience to ask questions. Then, either Thursday evening or Friday morning, you’ll participate in a co-working call and create tangible, marketing assets for your private practice. Lesson: Together, we will explore the similarities and differences between your niche, target market, and ideal client. You will learn several approaches to define your niche including segmenting by presenting problem, therapeutic modality, and passion/purpose. You will also work on identifying the emotional pain points of your ideal client. Co-Work: On our group call, we will dive deep into who we are called to serve through our practice. We will take this passion and apply it to different populations in our areas and figure out the best social media platforms to target our ideal clients. Lesson: During week two, you will learn how to set the foundation for all of your marketing materials so that every piece of content is cohesive and authentic. We will work together to build a platform for your content so that it speaks to your ideal clients’ emotional journey. Co-Work:In group, we will write out the mission statement of our practice as well as our main marketing message. Based on what we come up with, you will craft your brand voice and identify the key marketing phrases to be used on your website, blog, and social media. Lesson: I’ll teach you how to legally and ethically “stalk” your ideal clients so you can learn how they’re spending their time, how they’re spending their money and the exact language they’re using to talk about their problems. You’ll also learn how to mine your clinical notes and sessions for blog post topics that are relevant to your niche. Lesson: Week four is a pivotal week where you will start putting all of the pieces together. 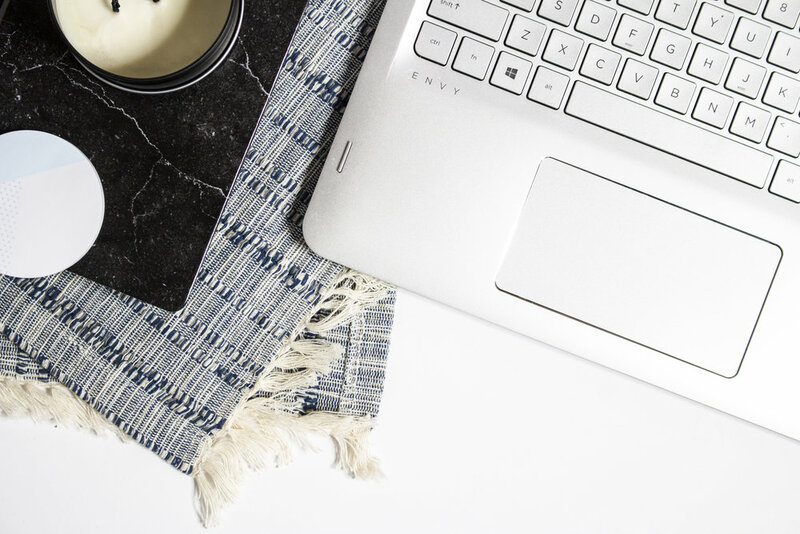 You will learn how to combine niche-specific language, target market research, your brand voice, and your key marketing phrases into content pieces that will draw in your potential leads and help convert them to paying clients. Co-Work: On this call, we will work together to outline a complete blog post. The finished piece will be on-brand and speak to your target market. You will be able to leave the call and go straight to writing marketing content pieces. Lesson: This week we will venture into the idea of promotion and I will share my signature system for peeling social media content ideas from your hero content. You will learn how to identify the main ideas and most share-worthy points from your blog posts and how to craft them into social media statuses to start drawing in ideal clients..
Co-Work: In group, we will work together to pull out social media statuses from the outlines we created in week 4. We will end the call with 30 days-worth of social media ideas that will draw followers back to your blog. Lesson: In this last lesson you will learn about different strategies to get your practice visible. We will discuss the differences between marketing and public relations and how you can use both to attract new clients. We’ll also talk about automation strategies so that you can set up your content marketing to be hands-free. Co-Work: During our final call, we will put everything we’ve learned together into an editorial calendar. You will finish the practical exercise with a complete 30-day marketing plan that you can systemize and repeat every month. Hi, I’m Marissa and there is one thing I’m positive about. Therapists have all the skills they need to become the BEST marketers. Seriously, even if your grad program taught you nothing about business, it still gave you everything you need to be able to attract and convert ideal clients. Sure, the online space is confusing. It changes extremely fast and there are all kinds of new trends and tricks to try to stay on top of. There’s a certain savviness that’s required to navigate the internet and to make your skills and your practice stand out in a sea of other clinicians. BUT, I’M GONNA GO AHEAD AND BE BOLD HERE AND LET YOU KNOW I’M 100% SURE YOU’RE OVER-COMPLICATING IT. See, good marketing is very similar to good therapy. All you need to do is communicate a message that helps the reader/listener/viewer of your content get in touch with their emotions. It’s literally the exact same thing you do day in and day out in session. If you can help your clients get from the top level, content, facts of their presenting problems down to the experiences, feeling, and cognitions behind them, you can market. Therapists who want to step back from coffee dates, large networking events, and pitching themselves to doctors and instead want to capitalize on online marketing to save time, energy, and dedicate themselves to their craft. When does the practical exercise start? This round of Cathartic Marketing begins October 8th, 2018 and runs through November 18, 2018. During this time, you will receive six lessons, six open office hours opportunities, as well as participate in six live co-working calls. How long will I have access to the lessons? You will have lifetime access to the course content and co-working videos. Each time I update the course, you will receive an email about the latest version and will be able to log in and see what’s new. However, we will only have co-working sessions for the six weeks the course is live. I've never been through a practical exercise before, what should I expect? 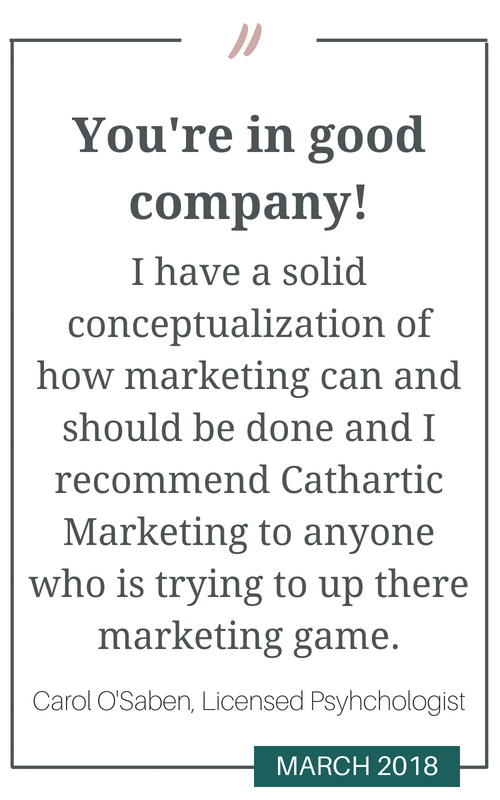 Cathartic Marketing is different than your typical online course or group program. Over the course of six weeks, you will receive weekly lessons as well as participate in co-working sessions. Each Monday morning you will receive your weekly lesson to study on your own. There are open office hours sessions every Wednesday. Then, later in the week, you, your group members, and I will work together to accomplish the tasks laid out in the weekly lesson. What if I hate to write? This system can be applied to any content creation medium. If you prefer video or podcasts or something else, you can use all of the skills from Cathartic Marketing to promote your practice in a way that maximizes your strengths, feels in line with your values, and meets your needs. How much time does the program require? You can expect to devote between 3 and 5 hours per week going through the lessons, attending the optional office hours and participating in the live call. What exactly does co-working mean? Unlike other group programs, where you get only a few minutes to ask your questions, we will be working together as a team to accomplish your goals. You will have direct access to me and your group members and we will work together to make sure everyone’s questions are answered. You will not feel left out, and I will personally help through any aspects of online marketing you find difficult or confusing. When do the co-working calls take place? There are two cohorts to best suit your needs. Thursday evenings at 5PM PT | 8PM ET and Friday mornings at 9AM PT | 12 PM ET. You are also welcome to bounce between time slots to best fit your schedule. The calls typically last from an hour to an hour and a half. What if I can’t attend the co-working calls live? Immediately after our group session ends, I will be uploading a recorded video to that week’s lesson page. This way you can revisit the recording and still have access to what the group worked through that week. We will be using Zoom for our co-working calls. This way everyone can work on their individual projects but see the rest of the group at the same time. We will have access to voice and text chat as well as view each other via video. If you use your desktop/laptop computer to access the co-working calls, you will not need anything else. If you use your phone or a tablet, you will need to download the FREE app. What will be my biggest take-aways from Cathartic Marketing? The purpose of Cathartic Marketing is two-fold. First, you will gain insight into yourself as a marketer and practice owner. You will learn the aspects of marketing that make you feel vulnerable as well as how to overcome emotions that are keeping your practice from growing such as impostor syndrome. 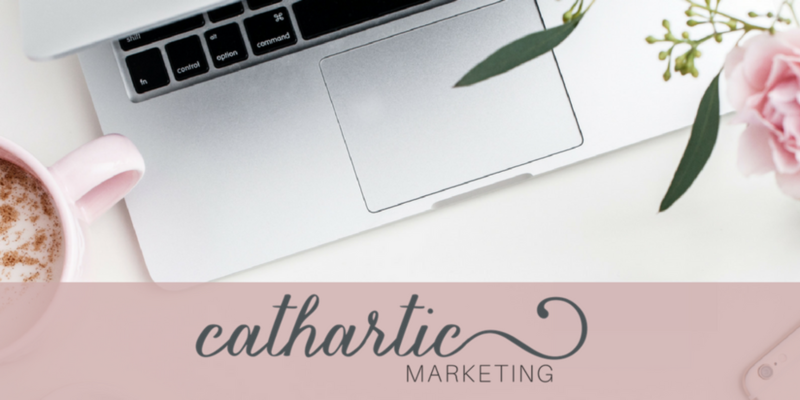 Second, Cathartic Marketing teaches you about the emotional buying process and how this applies to clients who are looking for a therapist. 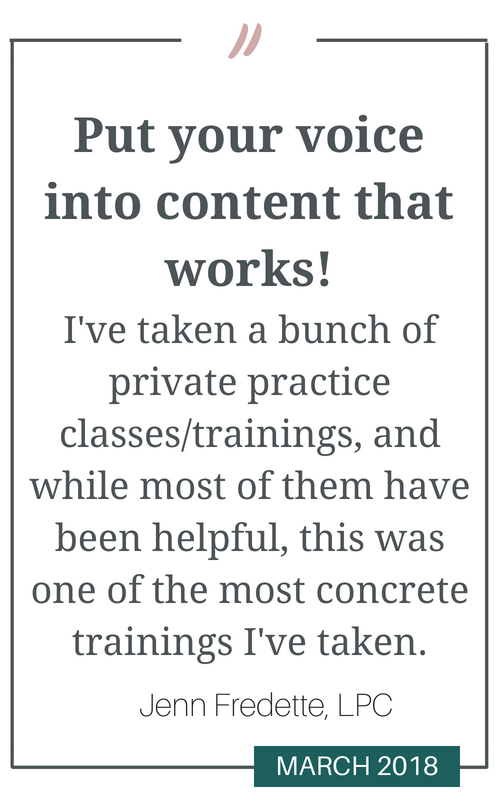 Ultimately, at the end of the six-week program You’ll have mastered my repeatable system to create content that promotes your practice online while feeling confident in your marketing strategy, meeting your prospects’ emotional needs, and filling your practice with ideal clients. The monetary investment in Cathartic Marketing is non-refundable. However, you can transfer your payment to the equivalent amount of 1:1 services.